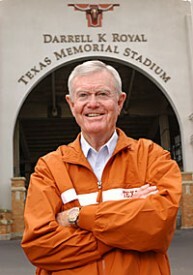 The University of Texas has confirmed that legendary Longhorns head coach Darrell Royal has passed away at the age of 88. Royal is Texas’ all-time winningest coach and led the Horns to three national championships (1963, 1969, and 1970) and won 11 Southwest Conference championships. I was lucky enough to meet Coach Royal on several occasions while at UT through the Terry Foundation. He was one of three people who interviewed me for the scholarship and being able to talk with him about football and growing up a coach’s son was an incredible moment. It’s a sad day for Texas fans. RIP Coach. WTH?! (What the Heck?) moments are attempts to find the memorable and the off-beat perspective on Longhorns sports. Here are some interesting moments from the Texas game against the Kansas Jayhawks. Pre-Game WTH Lawrence?! Some of the Longhorn players saw more fans at their high school playoff games than the 40,097 that were in attendance at this game. Interesting note that the 1983 television show “The Day After” was filmed here. Both of these programs had a lot of waste to bury after this one. 1st Quarter (12:37) WTH Gray?! Johnathan Gray first carry of the game went for 31 yards and the drive ended in a touchdown. Crazily that would be the only lead the Longhorns would have until the end of the game. Gray’s 111 yards should surely earn him the starting job for next week. 2nd Quarter (13:45) WTH Sims?! Is it me or does every UT opponent put up career highs in running yards? James Sims took the handoff for a 64 yard run which started KU toward their first touchdown of the day. Sims puts up 176 yards rushing on a UT defense that cannot stop a runny nose. Oh yeah, Kenny Vaccaro added a few more yards to this run with a personal foul. Halftime WTH Zebras?! Since this game was lacking a lot to be desired let’s take an inside look at referee Scott Novak and his team that worked this game. 3rd Quarter (8:57) WTH SEC?! The team wants to be a SEC style running team. Getting stopped by the 90th ranked rushing defense in the country on fourth down was demoralizing. Until you see the stats that Texas has the 108th rushing defense in the country. 4th Quarter (13:04) WTH Horseshoe?! After multiple interceptions by David Ash, the coaches decide to put in the lucky charm. Case McCoy provided some sort of spark that ended up in two touchdown drives to win the game. I thought we would have settled the quarterback situation by now. 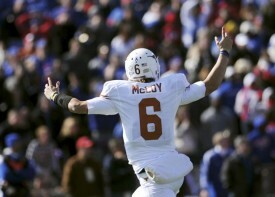 Thank goodness for another McCoy comeback to stave off a loss. Next up for the Longhorns is a road trip to Lubbock to take on the Red Raiders on November 3rd. WTH?! (What the Heck?) moments are attempts to find the memorable and the off-beat perspective on Longhorns sports. Here are some interesting moments from the Texas game against the Baylor Bears. QB David Ash had a solid performance for the Longhorns against Baylor. 1st Quarter (14:43) WTH Lighting?! Mack Brown needed a quick start to avoid most of the 101,353 fans turning on him and the team. Well, Daje Johnson took care of that with an electrifying 84 yard touchdown run on the FIRST play of the game. 1st Quarter (2:42) WTH Williams?! The Big XII leading receiver took the defense to task especially on a simple stop and go for an 80 yard touchdown to give the Bears their first lead of the game. Manny Diaz does this count as an explosive play? 1st Quarter (0:00) WTH Students?! Well, if you ever wondered where the student section is at DKR, you found out before the 2nd quarter. All the students broke out black Livestrong shirts to support the 15th anniversary of the organization. It’s interesting the salute with all that is swirling around Lance. 2nd Quarter (6:18) WTH 50 Shades?! Could not pass up the chance to report on the first touchdown of the season for one Johnathan Gray. He put a move on safety Sam Hall that left the defenders clothes on the ground. At this point in the game, BU Coach Phil Bennett and Manny Diaz were getting ready to work on their resume at halftime. 3rd Quarter (12:55) WTH Okafor?! Alex Okafor called out the defense to play tougher after last week’s game. 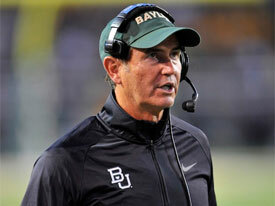 He needed to be called out for a crucial offside on fourth down that would have ended the Baylor touchdown drive. 3rd Quarter (6:31) WTH Black Swan?! The highlight of the night on the Godzillatron and the television broadcast was a shot of Natalie Portman. Wonder why she was there… who cares! 3rd Quarter (5:56) WTH Sooners?! OU fans in the stands wearing a Beat Texas shirt. Looks like these two guys forgot that the Red River Rivalry was last week in Dallas. Longhorn fans are still trying to forget. 3rd Quarter (2:17) WTH Mad Hatter?! Art Briles threw his ball cap so high in the air in disgust over the late Texas timeout on fourth down that WR Tevin Reese had plenty of time to make the fair catch signal when he caught his hat. 4th Quarter (2:34) WTH Mulligan?! The head referee announced to the crowd that Texas would get a “Do Over” to match up with the substitutions that Baylor was implementing. Mack Brown hopes next time a “King’s X” will be called when he needs to surrender. Next up for the Longhorns is a trip to Kansas to play the Jayhawks on October 27th. You will not see the normal WTH article this week from the Red River Rivalry because there was nothing good to report. After being annihilated for the second straight year from your biggest rival, it’s a reminder of where the program stands. The players and coaches talk about needing to get to work. Mack Brown said that I know what is wrong and I am the man to fix it. Unfortunately, we have been down this road before and the culture is not in place for this to be fixed. Sure the Horns can rally from this huge let down and win a couple of more games but the underlying problem is still there. The problem is the culture that has been established on the 40 acres. Fans enjoy hearing how recruit after recruit say that they love the family atmosphere that Mack Brown delivers. Many coaches say that you have to de-recruit the player when you get the kid on campus. The UT staff may want to rethink how they de-recruit a player. A high school kid feels like he has already made it when he sees the facilities, the opportunities playing in front of so many people, and the fact that they are on television all the time not to mention that the LHN is there to record their every move. It is very hard for a head coach to legislate the discipline when times are tough while the team sees the head coach as more of a father figure. The last time Coach Brown, who is 61 years old, unloaded on his team and the staff, he had his first losing season and lost most of his coaches. When Texas has won conference titles, the leadership has come from the players (McCoy & Young) themselves. Florida, Oklahoma and Alabama take their direction from their head coach. You will get a Tebow and a Bradford that will step up and take a lead role, but you know that Urban Meyer and Bob Stoops have their finger prints on their teams. Players and coaches take the identity of their head coach. 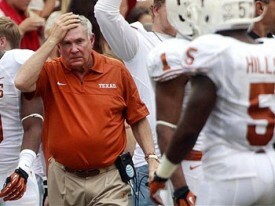 Right now the identity Mack Brown exudes is an exhausted, questioning and apologetic leader.